You can get the instructions by visiting the site over there......take time to look around...it really is a great site! To celebrate this great change in the Scrapbooking Memories on-line site.....I have a brand new copy of the latest issue of SM to give away. All you have to do is pop on over and have a look around the site...then come back and leave a comment below here.......winner shall be announced Monday! I'm sure this would look good under anyone's Christmas Tree. I'll even Gift Wrap it for you! and these punches are now available from Wholesalers.....so just in time for Christmas! These are Seasonal Squeeze Punches......and would make a lovely edition to a crafters stash! 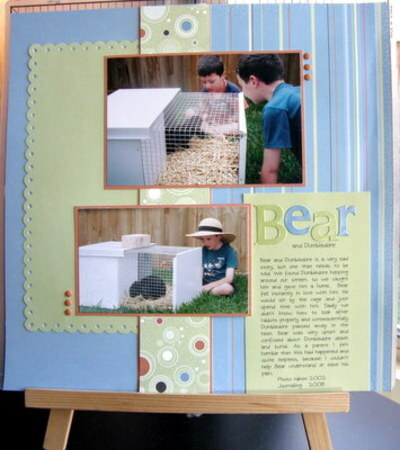 Head over to the Scrapbooking Memories website and check out the gorgeous layout by Angela O'Neale in the Technique Corner section. Ang has created a stunning layout using 'Nature's Flora' by Kimberly Poloson and some of our wonderful Fiskars tools. I'm the new Dawn Stan........LOL! I have also created a u-tube video on this punch so see if you can find it by searching our Blog! I've been doing more experimenting. Here I have a packet of makeup sponges. Some different colours of ink, old chipboard and plastic embellishment sheets, squeeze punches, scrap of cardstock and a shape template. Grab your plastic "template" (used plastic shape negatives) and a spare piece of paper. Dab/twist the inked sponge over the shape you desire. then chose a smaller circle and dabbed with a purple. A nice two toned circle. And get a perfect star! Cool huh? Well off I go again and see what else I can come up with. Get more out of your tools by experimenting. Till then have fun! 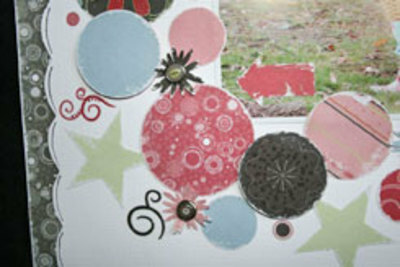 Check out this months Scrapbooking Memories technique corner featuring Cloud 9 Design, Sorbet Villa page kit, Stamp Blocks and Border Stamps. All products are available at K-Mart, Officeworks and Spotlight. I've always loved the Fiskars border punches. I personally think they are completely ingenius. What I'm hoping to do is walk you through some simple instructions on how to punch a perfect corner with the border punch. 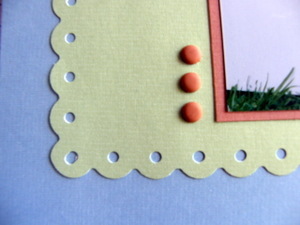 For the example I've used the Fiskars treading water border punch, but you could use any Fiskars border punch instead. STEP 1 (top left photo) Find this ridge on the top of your fiskars border punch. 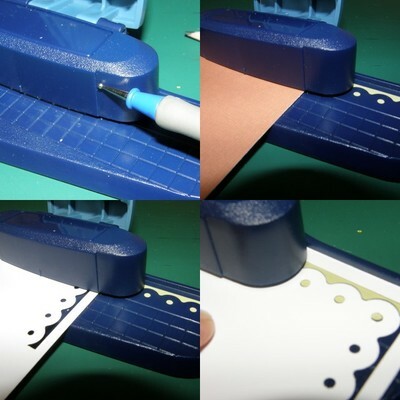 Use this ridge as your lining up guide for doing your corners with the border punch. STEP 2 (top right photo) Insert your paper right side up into your border punch, line the edge of your paper to the ridge. Hold firmly in place and punch. STEP 3 (bottom left photo) slide paper out of your punch and flip paper over so the wrong side is now facing up. Turn paper and insert back into border punch, again lining up the edge of your paper to the ridge. Hold firmly in place and punch. STEP 4 (bottom right photo) Move your paper along the base of your border punch and line up the punched put image to the painted shiloutte on the base of your punch. HELPFUL HINTS.... * Make sure your paper is pushed all the way in to the back of your border punch. * Be patient and careful with your lining up, as it directly effects the end result. 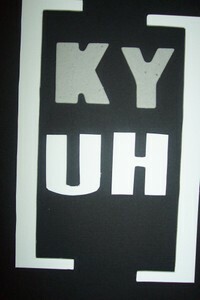 * Play around first on some scrap paper, it can abit tricky until at first. I've tried to make these instructions as clear as I can, If you have any questions just leave a comment and I"ll get back to you. One last photo, a close up of the corner. 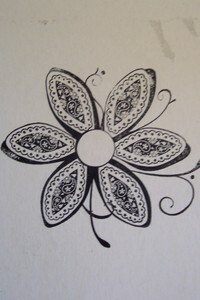 Over at the Scrapbooking Memories website the new Technique Corner is up for your viewing. This month we feature the Fiskars Fingertip Knife and Heidi Grace Designs, Urban Acres Blvd range. I love this range. 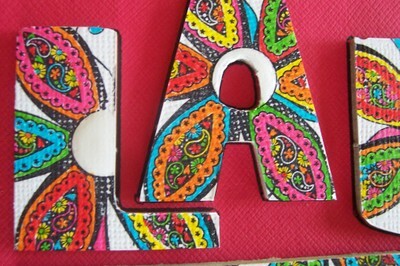 Love the colours and they are suitable for boys,girls, heritage, Christmas or whatever you wish to scrap kind of pages. Anyone who owns a Fiskars Fingertip Craft Knife will tell you how much they love to use it and how easy it is compared to a standard craft knife. Hello, hope you are having a fantastic weekend, I thought i would share a little technique with you to show you a different way to use your stamps. As some of you know I am a lover of the Heidi Grace clear stamp sets and i have used the paisley flower out of the "Wild Daisy Rd" clear stamp set. I love this stamp and have a lot more things planned with it!! I took part in an online challenge and this is the title I did for my page. I wanted it to be fun and bright. I used a quote that appeared on the Fiskars blog earlier on in the week ( I have a little book and i write down the ones that take my fancy) - it was "FIND SOMETHING TO LAUGH ABOUT EVERY DAY"
Lots of fun and lots of colour, pull out your stamps and have a go, you'll be more than pleased with the results. Do you want to see some cool ways of using our Fiskars Squeeze Punches and the Cloud 9 Design Chocolate Chalet range. 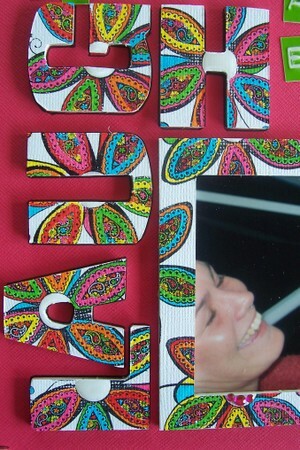 Head over to http://www.scrapbookingmemories.com.au/tech_corner.php to view the monthly Technique Corner.